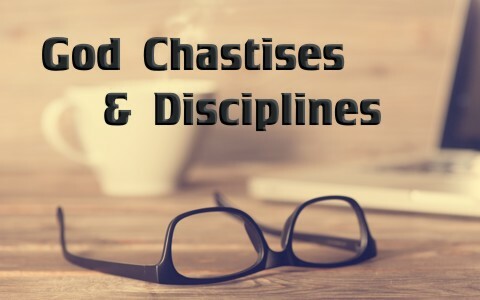 In What Specific Ways Does God Chastise His Children? God says He disciplines every child He loves, but in what ways does He do this? To begin with, God is motivated by His love for us when He disciplines us. Discipline doesn’t feel good at the time, but it’s truly an act of love, because the opposite of love is not hatred, it is indifference or apathy. To not care is to not love, and when there is no love, there is usually little or no discipline, and the consequences are tragic. The many prisoners I’ve communicated with have come from homes where the father is missing and every single burden is placed on the mother. Under these circumstances, mothers still do a miraculous job, but even here, when these (mostly) boys grow up without a father, they grow up without discipline. And without discipline, there is no respect for authority. It is the “perfect storm” where a child raises him or herself, and with little or no restrictions, the child is already in trouble with the law before they’re even a teenager. They’ve not been disciplined and faced consequences before so that they could learn to obey; instead, they live like there is no law. I’ve seen it all too often, so this is part of the reason God disciplines us. He loves us and doesn’t want us to hurt ourselves. He wants us to understand that those in authority are an extension of Him and resisting authority at home or in public is actually resisting Him (Rom 13:1-5), and resisting Him leads to nowhere good. If we can see God’s disciplining as an act of love and not of His anger, it can help us to see just how much He loves us. I spoke with a couple who had been Christians for years and years, and they were facing a financial catastrophe like I hadn’t seen before, so I thought maybe they should cut down on their giving at church, but I vividly remember them both looking down at the floor and finally saying, “Well, we don’t give to the church…” That might have been the reason they were in such a financial debacle. Of course, financial difficulties don’t always come for that reason, but it may be God’s way of getting their attention about something else in their life and causing them to come to Him in brokenness in prayer. Jesus once rebuked those who thought the blind man had sinned and that was the reason he was blind. We can think the same way if we’re not careful, but one way God might chastise one of His children is to humble them with a “thorn in the flesh.” Health issues can quickly become financial issues too with the cost of health care. The Apostle Paul has so many revelations and was probably the most brilliant man and scholar of His day, which he could have easily been puffed up, but God allowed a thorn in the flesh to keep him humble, and if we’re not humble to begin with, God may have to do it for us. When a marital relationship is shattered, so are two (or more) people’s lives. When children are involved, it is even more heartbreaking, because now there are innocent victims involved, and these children might even blame themselves. Divorces do more than shatter relationships; they can shipwreck a person’s life, even if they’re young when it happens. And, children’s feelings are more fragile and sensitive than ours are. Whatever we feel is multiplied by 10 for them. When shattered relationships come between spouses or parents and children, it can bring us to our knees, and perhaps God wanted that to begin with. Whenever a Christian is living in sin, they are often living with no assurance of their salvation. Sometimes they begin to have fears of hell and doubts start to creep in. Their minds can accuse them by telling them, “You’re a hypocrite…you’re a fake!” Of course the enemy can do that too, but the spiritual attacks may ramp up when you have lost your fellowship with the Father. You don’t lose your relationship, because if my son broke a lamp (which he did when young), he was still my son, but our relationship was not the same. If you cannot pillow your head at night without the full assurance of your being saved, then God may have withdrawn His giving you assurance. The Spirit may not witness to us that we’re the children of God, like Paul suggests (Rom 8:16), if we are willfully living in disobedience. Of course, they may not have assurance because they are not saved and God has never brought them to repentance and faith, so it’s a good time to examine one’s self to see if they’re in the faith. I believe that every Timothy needs a Paul, so everyone (including me) needs a mentor, so God may use others to see what you don’t see, and bring you correction, but clearly correction is something we all need, and is considered a loving thing to do. The most loving thing you can do is to be willing to offend a Christian acquaintance by correcting them if they are clearly in the wrong or living in sin. Wise King Solomon wrote, “Faithful are the wounds of a friend; But the kisses of an enemy are deceitful.” (Prov 27:6 KJV). This isn’t just a nice saying…it is a true principle. Kisses are softer and nicer, but they don’t help us. The wounds from a close Christian friend are intended for healing, just as God’s discipline is meant for our good and not harm. When we see someone else going through a trial we must not assume that God is disciplining them. That would be like trying to accuse the Apostle Paul of having a thorn in the flesh because he is living in sin. The author of Hebrews wrote, “My son, do not regard lightly the discipline of the Lord, nor be weary when reproved by him. For the Lord disciplines the one he loves, and chastises every son whom he receives” (Heb 12:5-6). I have been disciplined by God, and probably will be again, and I must admit that at “the moment all discipline seems painful rather than pleasant, but later it yields the peaceful fruit of righteousness to those who have been trained by it” (Heb 12:11), so let’s you and I remember that God “disciplines us for our good, that we may share his holiness” (Heb 12:10a), and His velvet vice on our lives is an act of love. He is shaping us and molding us and conforming us into the image of His Son. This proves that discipline equals love but no discipline equals apathy. Let it never be so in us. Previous post: What Are Reasons Some Christians Doubt Their Salvation? Next post: What Does the Bible Say about Diligence?